Kiyamachi (木屋町) towards Sanjo Kawaramachi, as seen from a building nearby Shijo bridge. The clock tower in front belonged to Murata Watch Shop (村田時計店) and was a famous landmark on Shijodori. The brick building in the very middle is the office of electric power corporation Kyoto Dento (京都電燈株式会社). It stood along Takasegawa, the narrow canal which can just be seen on this photo. Opened in 1611, the canal ran from Nijo to the Yodogawa in Fushimi/Chushojima and for several centuries was Kyoto’s most important trade route for transporting goods like rice, charcoal, salt and wood. Kiyamachi plays an important role in Japanese history as it became a popular clandestine meeting place during the 1860s for forces wishing to overthrow the government. Dating a photo is always extremely difficult, but this one features some interesting details that make it easy. On this image, the east side (東半分) of Kyoto Municipal Office (#5 on image below) is still under construction. 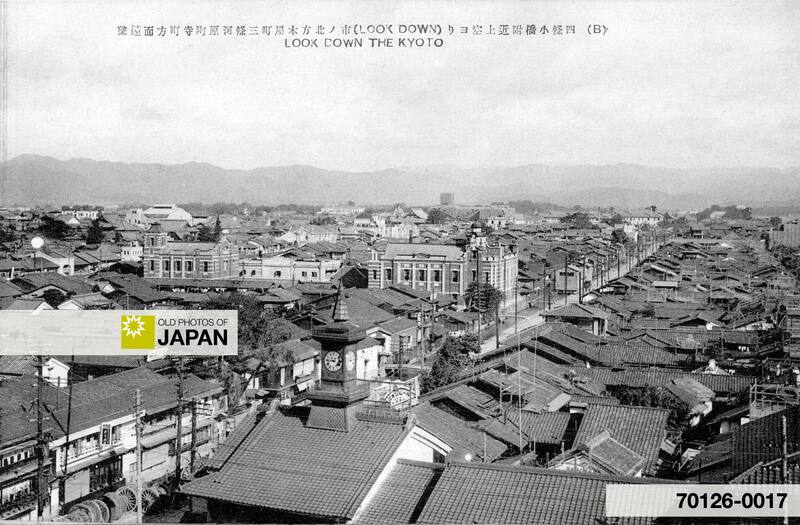 It was finished in 1927 (Showa 2).1 As if that wasn’t sufficient, only the old building of the Kyoto Hotel (#7) is visible here, whereas in 1928 (Showa 3) a new 7-story annex was completed.2 This photo can therefore be dated to around 1926, right at the start of the Showa Period (1926-1989). 1. Kita-ku; 2. Clock Tower of Murata Watch Shop (村田時計店の時計台); 3. Honnoji; 4. Kyoto Dento (京都電燈株式会社); 5. Kyoto Municipal Office; 6. Takasegawa; 7. Kyoto Hotel. This area was originally called Korikimachi (樵木町). But after the canal was opened, many lumber dealers established themselves along the canal to process the logs that were transported here from Hozugawa via Marutamachi. Soon, people started to call this area Lumber Merchant Town, Kiyamachi. It was a name that stuck. 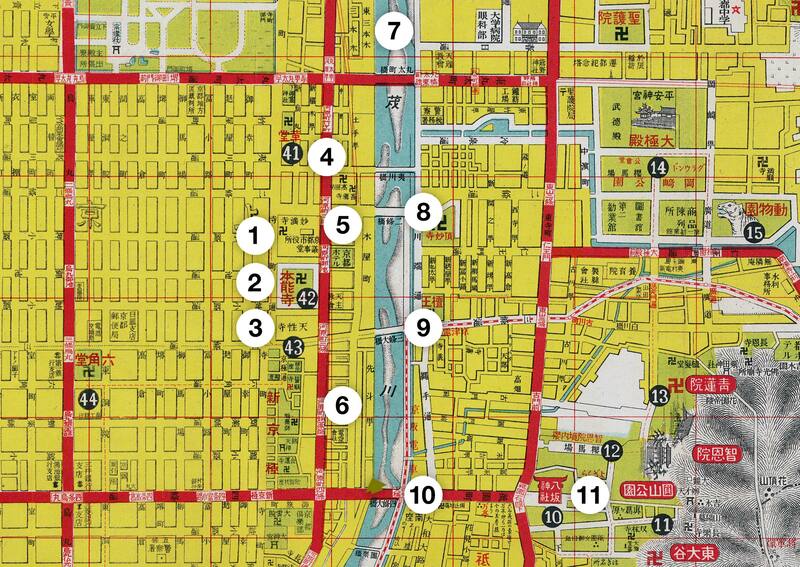 Thanks to the canal, this area became extremely prosperous during the Edo Period (1603-1868), and besides lumber merchants, many other businesses started up here as well. The large number of travelers and business people in turn attracted restaurants, sake shops and inns (旅籠), which made this area into one of Kyoto’s most lively pleasure quarters. Because of the many available public meeting places in Kiyamachi, many anti-Shogunate conspirators met here clandestinely during Bakumatsu, the final years of the Tokugawa Shogunate. When they were found, things usually got ugly. On July 8, 1864, for example, the special police force Shinsengumi discovered a plot by samurai from Choshu (now in Yamaguchi Prefecture) to set fire to Kyoto and kill Katamori Matsudaira (1836-1893). Matsudaira was an important daimyo (lord) who was in charge of policing Kyoto. While the festivities of the Gion Matsuri took place in the background, the Shinsengumi found the conspirators at Ikedaya inn and killed seven of them in a brutal fight. Twenty-three were arrested. The event became known as the Ikedaya Incident3 and triggered the Kinmon Rebellion of August 20, 1864, in which two thirds of Kyoto was burnt to the ground. A dramatization of the Ikedaya raid from the movie Shinsengumi (1963). The famous revolutionary Ryoma Sakamoto (1835-1867) also lost his life in this area. On December 10, 1867, he and his collaborator Shintaro Nakaoka were assassinated at the Omiya (近江屋) soy sauce shop on nearby Kawaramachidori. Kiyamachi is actually filled with such historical events. Unfortunately, none of the buildings of those days remain, but many stone and wooden markers identifying historical locations can be found everywhere. In 1895 (Meiji 28), a street car line (京都電気鉄道) was opened on Kiyamachidori between Nijo and Gojo. To accommodate the tracks, Takasegawa was narrowed, changing the feel of the place remarkably. In 1920, Kawaramachidori was widened, and the tracks were moved to that street. The same year, Takasebune (高瀬舟), the shallow-draft boats used to transport goods, stopped plying the canal. Other types of businesses, like Kyoto Dento, now settled in Kiyamachi and it lost much of its previous liveliness. Today, Kiyamachi is once again an entertainment district. The area is filled with restaurants, cafés, bars, variety stores and even many fashion boutiques. At nearby Pontocho, one may catch a glimpse of a Maiko in her traditional hairdo and beautiful kimono. Uniquely, in a country where most rivers have been filled up or redirected into monstrous concrete basins or hidden tunnels, water still flows quietly through Takasegawa. In Spring, cherry blossom along the canal gives the area a romantic and cheerful feel. 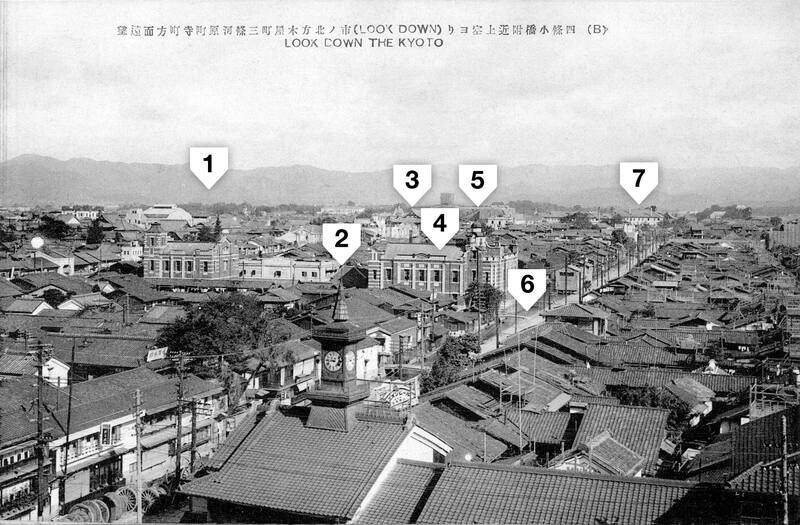 1928 (Showa 3) Map of Kyoto: 1. Kyoto Municipal Office; 2. Kawaramachidori; 3. Nijobashi; 4. Kyoto Hotel; 5. Honnoji (Oda Nobunaga was forced to commit suicide here); 6. Kamogawa; 7. Tenshouji; 8. Sanjo Ohashi; 9. Kyoto Dento; 10. Shijo Ohashi. 1 Architectural Map. 京都市役所本館。Retrieved on 2008-07-31. 3 SamuraiWiki. Ikedaya Affair. Retrieved on 2008-07-31. 4 The Kyoto National Museum held an exhibition about Ryoma Sakamoto in 2005. The exhibition site features interesting images. 5 The site Kiyamachi Walker features an in-depth introduction to Kiyamachi. Highly recommended. You can also licence this image online: 70126-0017 @ MeijiShowa.com.